Our New Ad, Featured In Numerous Media Markets! Mountain Vista is one of the most beautiful Beavers Bend cabins in Broken Bow, Oklahoma. Mountain Vista luxury Beavers Bend cabin is located near the Kiamichi Mountains and Beavers Bend State Park. The clear waters and luscious green forests offer the perfect vacation getaway in Broken Bow, Oklahoma. Outdoor activities in Broken Bow include everything from fishing and hiking to bird watching and golfing, there is something for everyone. Breathtaking views and luxurious amenities await you at Mountain Vista. This is not simply a rental cabin, it is the vacation home created by Jerry and Sherri Isbell. Jerry’s heritage in Southeast Oklahoma goes back decades as his grandfather was the first eye doctor to serve the citizens of the Beavers Bend region. The Isbell’s founded this highly sought after vacation destination after searching scores of undeveloped property in Beavers Bend’s upscale Southern Hills Addition. Upon seeing the breathtaking views and witnessing the sights and sounds of nature, they were captivated by the setting and knew immediately, this land was the acreage in which their dream home should be built. Jerry and Sherri place a high priority on providing their Broken Bow Lake cabin guests with the ultimate experience of nature and luxury. Mountain Vista guests say they feel at home soon after arrival. The constant theme among guests as their stay draws to an end is “We don’t want to leave!” Broken Bow Lake offers amazing boating and fishing opportunities while Mountain Fork River boasts the best fly fishing in our region. Visit the area museums in McCurtain County, take a hike on the David Boren Hiking Trail or spend a few hours on the lake with a fishing guide. Cedar Creek golf course will test your skills while offering beautiful views of towering pines and manicured greens. Beavers Bend State Park has two-million annual visitors for a reason… It’s beautiful here and only about three hours from Dallas. Jerry and Sherri invite you to Visit McCurtain County soon! Our guests receive free passes to the beautiful new BMW Fitness Gym! We always provide free firewood and s’mores kits. 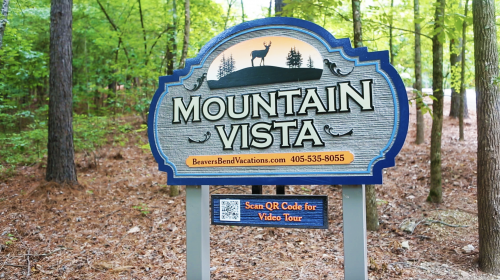 Mountain Vista in Broken Bow, Oklahoma has no add-on fees for cleaning, insurance or resort charges. Search the App Store for “Beavers Bend” and download our app for tourist information and VIP offers. BeaversBendVacations.com is now available to provide professional media, marketing and management to elite luxury cabins.